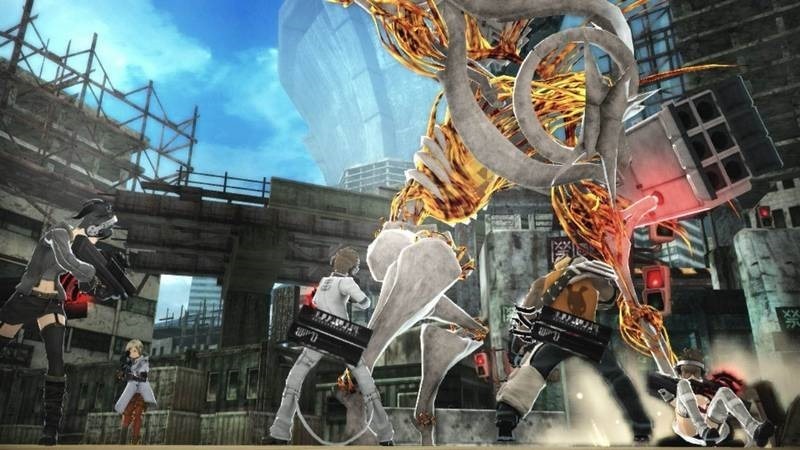 Freedom Wars review – FOR FREEDOM! Nelson Mandela once said “Let freedom reign. The sun shall never set on so glorious a human achievement.” and how glorious it is, when you are truly free. Freedom Wars’ basic premise is that you, the player, has lost all rights to be free and you either fight to get it back or wither away as a prisoner of society. The choice is yours. Freedom Wars takes place in a dystopian realization of earth where resources are scarce and the number of humans is dwindling. Deemed a sinner, you are the lowest of low in the hierarchy. Your job is to go out into the world and gather these precious resources for your home, known as a Panopticon. Other Panopticons are fighting for the same reason and there is a constant struggle for resources and citizens. A citizen’s purpose is different to that of a sinner as they’re responsible for tending to the engineering and development of Panopticons. Rivalling Panopticons will send out giant weapons known as Abudctors that steal citizens and even human life is treated as a resource. Your character suffered a devastating injury that lead to him/her losing their memory. As a result you were subsequently slapped with a sentence of one million years for forgetting all that your Panopticon has taught you and had all your rights revoked. You cannot run for more than 5 seconds or sleep lying down unless you’ve earned the right to do so. This really drives home the feeling that you’re a slave to your Panopticon and you have no say in your own destiny. You’re always being watched by a humanoid that is assigned to you and you will immediately be penalized with more years added to your sentence if you break any of these laws. It’s a great system that doesn’t actually enhance the gameplay but does absolute wonders to the world and story building. Freedom Wars manages to neatly include almost every cliché anime character in the book. We have the over-zealous best friend/sidekick who’s always ready for an adventure. Then there’s the eccentric older brother type character with an irrational sister-complex and to accompany all the youngsters on their road to freedom is the gruff and buff older mentor who seems like he might be able to punch you into next week but instead he’s softer than a marshmallow. They’re not without charm though, and they do grow on you after some time, but I would’ve loved to see some diversity in the characters to suitably complement the world they live in. Over the years Monster Hunter grew to define its own genre of games and we’ve seen many of these come and go over time. 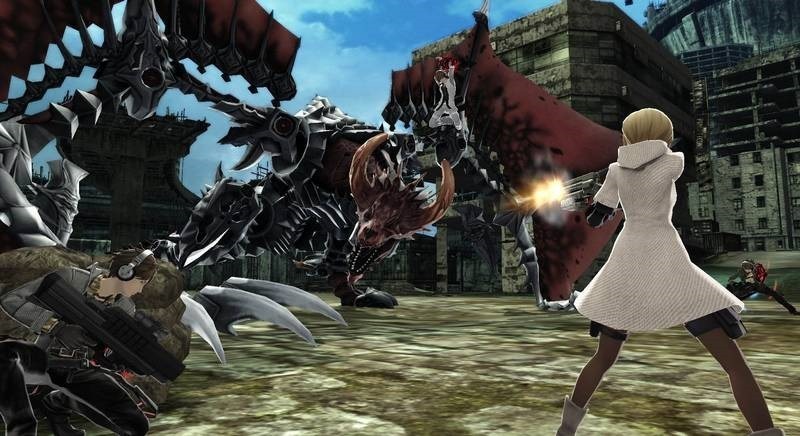 From Sqaurenix’s Lord of Arcana to Namco Bandai Games’ God Eater, all of them all had their own unique take on the genre while still sticking to the core fundamentals of hunting and gathering. 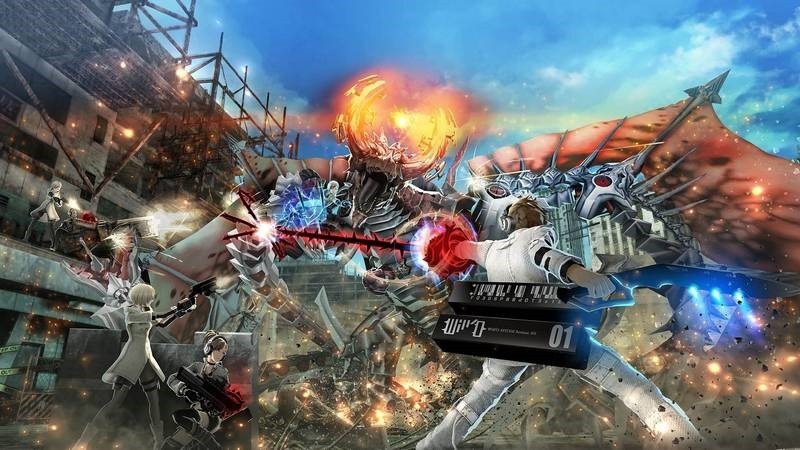 Freedom Wars is no different this time, but it introduces so many fresh and new mechanics that makes it stand out from the rest. One of them is a weapon known as the thorn. 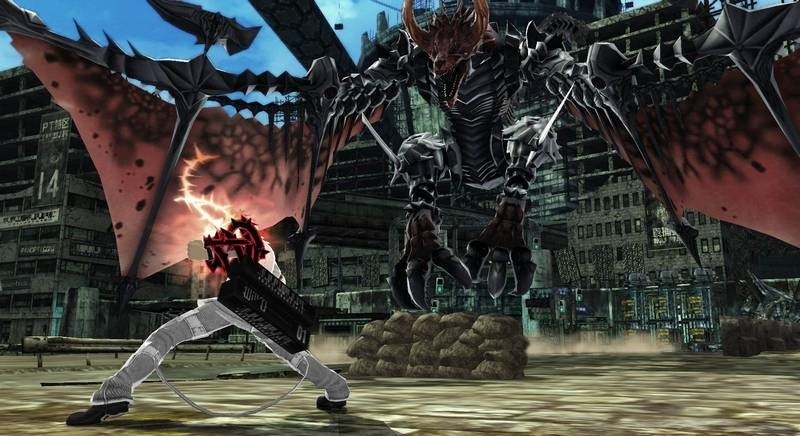 The thorn in Freedom Wars is a whip-like weapon that can be used to attach yourself to enemies and the environment alike allowing you to propel yourself forward to wherever it is attached. This adds a fantastic dynamic and sense of verticality to combat as you’re able to attach your thorn to tall buildings and traverse the environments from both the ground and rooftops. Combat always manages to feel fast and fluid and the thorn adds a nice layer of strategy. Do you want to use your thorn to lessen the distance between yourself and your enemy or would you go for the higher ground and provide cover fire from up above? These types of questions help in maintaining the pace of each battle and there was never a dull moment in combat. The thorn also defines your overall role in the team. There are three types of thorns, one specializes in attack and trap abilities while the other two deals with team defences and healing respectively. Each thorn has a few abilities that can be used by charging up your thorn in battle by holding down its button. While your AI companions do a decent job of utilizing each thorn type, it is in co-op where this mechanic shines. Working together with real people was an absolute joy. One team member would set up a trap while another boosted defence and provided cover from above with reserve teammates on standby to heal, and even though you’d always get that odd Leeroy Jenkins member, it was always fun. Even when playing with complete strangers, we were able to work well together and organically execute some awesome strategies. I’m not a huge fan of co-operative gameplay, but this was really some of the most fun I’ve had on the system. When starting the game you’ll have to align yourself with one of 50 Panopticons relating to real world locations. These are like clans that you can choose to belong to and by contributing resources to your Panopticon and competing with rival ones; you’ll be able to climb the leaderboards to the top. This is not separate servers however; it is more of a unique take on a ranking system. Currently Cape Town is ranked 48th out of the 50 Panopticons, and is the only Panopticon relating to South Africa. It’s pretty awesome to you see how your sinner rises in ranks as well as your city. 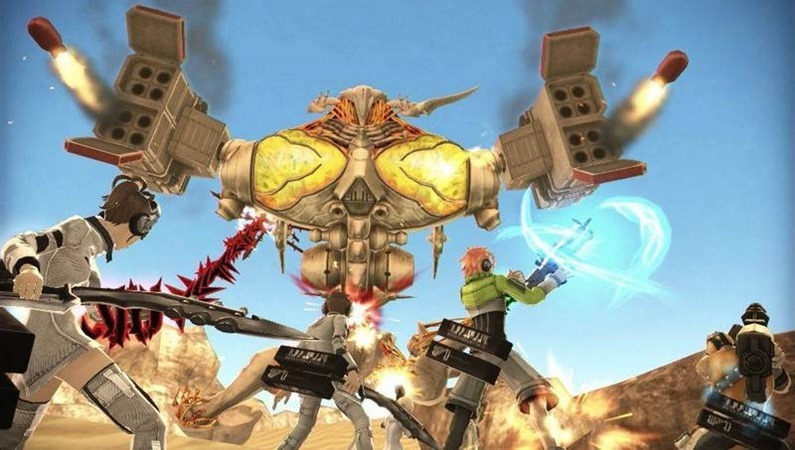 This being a Monster hunter type game all your resources that you gathered during battles are used to develop new weapons, supplies and upgrades. You’ll build manufacturing warehouses which are used to upgrade and create these items but each process takes some real world time to complete so you can’t immediately use it. You can also request the help of citizens you’ve rescued during missions to help reduce the manufacturing time. Freedom Wars is a great title to add to your Vita library, sporting some slick graphics and sound and an incredibly fun combat system. While its plot is intriguing, the characters themselves don’t do much to elevate it beyond being just a good story. I enjoyed my time with the game, and I’ll continue fighting for my Panopticon in the months to come.